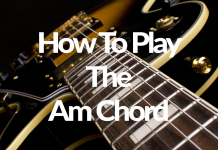 is important for you as a beginner guitar player to learn the proper names for the parts of the guitar. When you talk to other musicians or people that work at music stores it is important for you to be able to communicate with them about the guitar in a proper manner. 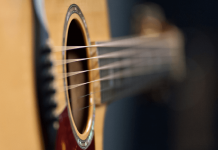 Head stock – If you are right handed and holding your guitar, the head stock is the part of the guitar to the far left that holds the tuning pegs. Tuning Pegs – The tuning pegs are the devices that the strings are wrapped around. They not only hold the strings, but they are also used to tune the strings. Usually you will have 3 tuning pegs on each side of the headstock. Some guitars have all six tuning pegs on one side of the headstock. Nut – The nut of the guitar is the part of the guitar that guides and holds the strings in place right before they get to the headstock. Usually the nut is made of plastic, bone, graphite or metal. Neck – The neck of the guitar is the entire part of the guitar from the head stock up to the body of the guitar. The neck is where your fret board is located. Fret board – The fret board is the part of your guitar that holds the frets in place. Most of the time, the fret board is another piece of wood glued on to the neck. 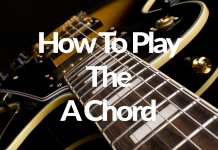 The fretboard is usually made of rosewood, maple, or ebony. Frets – The frets of the guitar are the metal strips that run vertically on your fretboard. Frets are usually made of nickel or stainless steel. 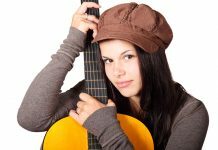 Body – If you are holding your guitar, the main part to the right is called the body of the guitar. Guitar bodies come in all different shapes and sizes. 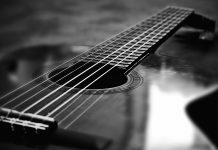 Bridge – The bridge of the guitar is the part that holds the strings on to the body of the guitar. On an acoustic guitar the bridge is usually made of rosewood or ebony.